Research guide to provenance resources at the Clark library, with emphasis on the World War II era. 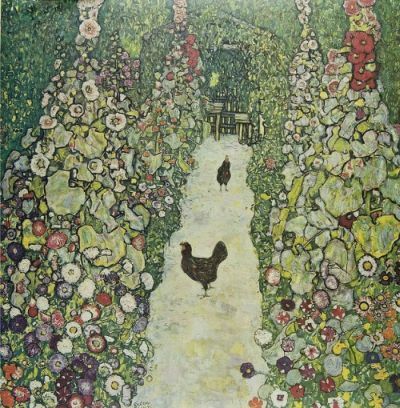 Among many paintings from the Erich Lederer collection, Garden Path with Chickens (1917) was removed to the Schloss Immendorf in Lower Austria for safekeeping during World War II. When the castle was burned by retreating SS troops in 1945, the painting was destroyed. The resources listed below provide photographs and other documentation on works of art reported missing or stolen from public and private collections during World War II. Click the "Internet Resources" tab for a rich array of further online sources on stolen and looted art. The Information Database contains information and documentation from forty-nine countries, including laws and policies, reports and publications, archival records and resources, current cases and relevant websites. The Object Database contains details of over 25,000 objects of all kinds – paintings, drawings, antiquities, Judaica, etc – looted, missing and/or identified from over fifteen countries. Committee on the Preservation and Restitution of Works of Art, Archives and Other Material in Enemy Hands. Works of Art in Austria (British zone of occupation): Losses and Survivals in the War. London: H. M. Stationery Office, 1946. Office de récupération économique. Répertoire d'Oeuvres d'Art Dont la Belgique a été Spoliée Durant la Guerre 1939-1945. Brussels: Royaume de Belgique, 1948. Missing Art Works of Belgium. Bruxelles: Ministère des affaires économiques, 1994. Répertoire des biens spoliés en France durant la guerre, 1939-1945… List of property removed from France during the war 1939-1945. Tome II: Tableaus, tapisseries et sculptures. Berlin: Impr. Nationale, 1947. Click here for the online version . Schloss Collection, Non-Restituted Works Looted 1943-1998. Published by the French Ministry of Foreign Affairs, this website lists over one hundred works still missing from the collection of Adolphe Schloss as of July 1, 1997. Includes images, descriptive information, and cross-references to Répertoire de Biens Spoliés. Bernhard, Marianne. Verlorene Werke der Malerei in Deutschland in der Zeit von 1939 bis 1945: Zerstörte und Verschollene Gemälde aus Museen und Galerien. Munich: Ackermanns, 1965. Laszlo Mravik. The ‘Sacco di Budapest’ and Depredation of Hungary, 1938-1949: Works of Art Missing from Hungary as a Result of the Second World War. Budapest: Hungarian National Gallery, 1998. Works of Art in Italy: Losses and Survivals in the War. Compiled from War Office Reports by the British Committee on the Preservation and Restitution of Works of Art, Archives, and Other Material in Enemy Hands. London: H. M. Stationery Office, 1945-46. Morozzi, Luisa. Treasures Untraced: An Inventory of the Italian Art Treasures Lost during the Second World War. Rome: Instituto poligrafico e zecca dello stato, 1995. Venema, Adriaan. Kunsthandel in Nederland, 1940-1945. Amsterdam: Arbeiderspers, 1986. Museum Boymans-Van Beuningen Koenigs Collection. Missing Old Master Drawings from the Franz Koenigs Collection Claimed by the State of The Netherlands. The Hague: Netherlands Office for Fine Arts, 1989.